The Mountain Club of Kenya first started as the Mountain Club of East Africa (Kenya Section) in 1938 but it has been in existence as a separate club since 1949. We are a community of impassioned climbers and hikers. Our boots have logged countless miles and our climbing shoes are worn with holes: proof of our determination, enthusiasm and love for the outdoors. With these experiences, our members have cultivated a spirit that leads them to shy away from the beaten path, instead opting to forge new frontiers, embrace new challenges, develop our skills, and open new routes. Our adventurous spirit comes with a sense of responsibility and independence, borne out of the wisdom and experience that has been built over countless expeditions. It’s what we do, what we breathe, what makes us feel alive. A member of the Mountain Club of Kenya is an impassioned, independent and responsible participant in the natural world—climbers and hikers who neither need nor desire all the details to be clearly laid before them, but rather are outdoor enthusiasts with an open mind and the skills needed to embrace the unscripted journey before us. But that’s not all that we do – we not only breathe in the beauty of nature, we also strive to play a part, to nurture the next generation of responsible adventurers, to return the favor —we strive to preserve the serenity and pristine condition of our mountains and natural wonders of Kenya. Our members generously contribute to this meritorious cause through organizing “clean-ups” and supporting organizations bestowed with the responsibility of managing and maintaining these natural assets (e.g. KWS and the Mountain Trust of Kenya). We take care of Kenya’s wildlands because the wilds of Kenya take care of us. We meet at a pre-announced location in Westlands, twice a month – the second and last Tuesday of the month. We organise meets every two to three weeks. These are often hiking trips, some of which are easy day walks while others are more strenuous. Every few months, there is a climbing meet, but groups of climbers go out climbing almost every weekend. 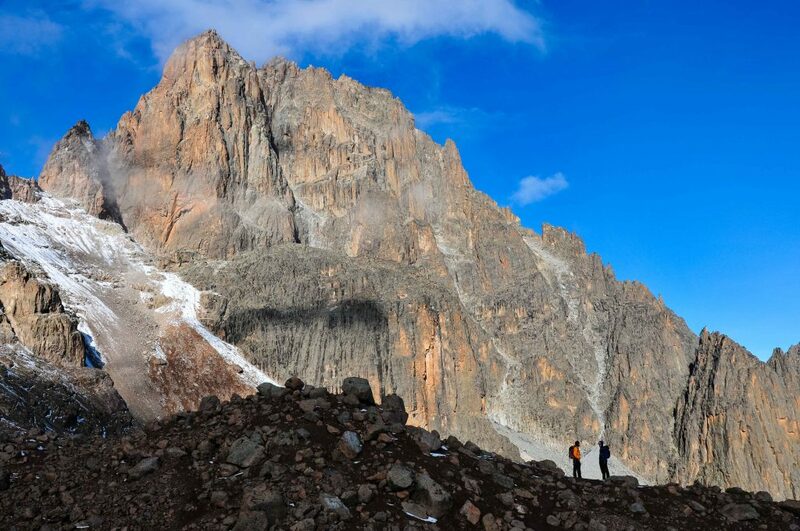 We also organise climbing instruction and camping at Lukenya, a hill that we acquired in the early 1960’s. This is 40 km south of Nairobi. You can contact the Committee here. About every second or third weekend there is an activity organised by a member. There is usually an announcement and a list for you to sign yourself up on; this is posted on the notice board in the entrance hall. On the Tuesday before the event, there may be a briefing on the outing in order to sort out transport and other logistical problems. You will find a list of activities of the coming months in the Newsletter (we try to be 3-4 months ahead of time when planning the activities). The current Newsletter is always posted on the club notice board. Mountaineering and rock-climbing activities tend to be arranged by individual members on an informal basis. Rock-climbing for beginners is arranged twice a year at our own crag at Lukenya. The Club owns a part of the Lukenya Hill, which provides many good possibilities for rock climbing. It is ideal for both beginners and experienced rock climbers and it has a unique setting. It is situated 40 km south of Nairobi along the Mombasa road. There are two guidebooks on the climbs at Lukenya available and they give you the directions to get there. Members of the club have free access to the club-owned property at Lukenya. Non-member visitors must become temporary or daily members for a small fee. MCK does not allow use of Lukenya for commercial purposes/gain. Some time ago, we experienced some problems with security so we now advise you to follow a few simple rules when you go there. Do not leave your car unattended at the base of the cliffs. Either park your car at the Lukenya Academy (the school just north of the cliffs), obtain a guard from there or bring one with you. Try to avoid walking alone on the hill. Do not camp anywhere apart from at our campsite on top of the hill. Athi River Police Station provides personnel for security and this is usually a good idea when camping. It is advisable to contact the Athi River Police Station Sergeant-in-Charge one or two days beforehand. Please talk to any of the members for further information and if anything happens to you at Lukenya, you should report the incident to Athi River Police Station and to the MCK. The Club owns four huts on Mount Kenya: the Teleki Valley Rescue Hut, Black Hole Bivvy, Bailles Bivvy (unusable) and Howell Hut. If using the huts, please do not leave ANY litter in their vicinity and please toilet well away from the hut. Others would also like to enjoy them after you. Please talk to any of the Committee members for further information on the use of the huts.